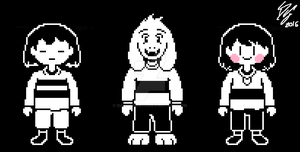 I don't even know if Undertale is relevant anymore, but here it is anyways. Edit: BTW anyone can use these sprites, just credit me. 'sup, mind if I use the chara sprite for a custom Four Souls card? If I must credit, then I will do so whenever the stuff will be set whenever the mod for Tabletop will go public. if it ever does go public. Hi, i used the frisk, and i'll credit you. Can I use it? It's for a video! Why do these look like Ethan Harper’s? Yeah, I just used Paint. It works pretty well with the only downsides being a lack of zoom and transparency. Hello, we are the Skycraft team, we would like to ask for permission for the use of your beautiful graphics for our Undertale project. We will be really happy if I accepted and we help her! Demo 1.2 is coming to summer. You have permission, just leave credit. Can my Friend edit them? I'm very sorry if I didn't read the description but it's just that I need to confirm that level of acceptance when my friend wants to use your battle sprite in a GAME. The game is by Toby Fox so yeah. So please do not get angry at me for "not reading" or "not understanding" your edit in the description, soooo you're fine with that? (He credits EVERYONE who made the materials he uses much like what I'm doing now). Sorry for responding so late, but yes you can use the sprites. Just be sure to credit. Is it alright if I upload a edited version of this? 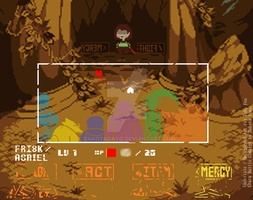 Not like enhanced, but like, I made my own fallen child (Using the same body format and everything, but different colors and a meshed face of both Frisk and Chara) And I also make color versions too that I was curious If I could upload? I will credit you, of course, I just wanted to make sure it was ok! I did the edits awhile back and they've kinda been sitting in my folder for awhile, and I kinda wanted to share them, but like I said, I wanted to make sure first! It is completely alright if you don't want me to post the pictures! If you haven't already posted them, then go right ahead. Again, just credit me. can i use this for my au?? Don't know what an au is but sure. hay i got a question can i upload my enhanced Version of this? Il Credit You In It. Thanks! And thanks for like 200 emoticons. wow! these are great! i especially love the frisk one. Just credit me in the description or something.